Fresh and intense on the nose. There's lots of citric fruits coming through, nicely mixed with vanilla and gentle honey. This is nicely wrapped in lingering peat smoke. Ginger spice intermingles with toffee notes in the back. Less briny and Islay-like as batch No. 1, but fruitier and minerally. Fairly strong on the palate. Pleasantly sweet at first with vanilla and toffee, accompanied by a warming mix of spices - mainly ginger and white pepper with a bit of cloves. Barley sugar and a touch of bitter oranges linger with restrained peat smoke towards the finish. The finish shows medium length with a touch of bitter orange peel, subtle oak, nutmeg and dry peat smoke on the tail. There's more citric fruits coming through by adding a few drops of water. The briny and maritime character comes to the fore while peat and smoke are slightly tamed. Still sweet on the palate with vanilla and honey, followed by aniseed and slightly warming spices. Becomes drier with oak and cloves. The finish shows good length with aniseed, oak and a touch of peat smoke. 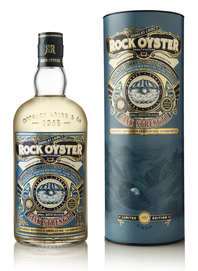 The second edition of Rock Oyster Cask Strength is much more restrained in aroma and taste than its predecessor. The blended malt has a clear citrus note, paired with a delicious vanilla sweetness and warming spices. The peat smoke remains discreetly in the background and only reveals the proportion of Islay whiskies to a limited extent. You can notice the youthfulness of this malt, but the aromas harmonise beautifully to a pleasant and lasting taste experience.